Debate team members show off their trophies after their first victory last semester during the Mississippi College Deep South Debate Tournament in Bossier, La. Team members include (standing, from left): coach Adam Key, Alex Scott, Sam Roberson, Grayson Posey, Clayton Goss, Nancy Severson-Olson, Addison Reed, Adesuwa Omoruyi, Jeremy Trepagnier, Clyde Lawson, and Lauren Castator; (kneeling from left): Jerusha Rodgers, Lindsey McCord, and Ingrid Slup. The re-emerged Sam Houston State University debate team is continuing the tradition of the past team’s incredible performances this year. Reinstituted in the fall, the team has already argued its way to three out of three victories, putting it back where it was when it was dismantled in 2003 due to an illness by then-team coach Debbi Hatton, instructor of speech communications. Adam Key, the team’s current coach, was the driving force behind its latest incarnation. Key, a speech communications graduate student, was a member of the multi-time national champion debate team at Stephen F. Austin State University and had debated three years prior to that in high school. When he was younger, his family would travel together to watch his brother’s debate team, which is what sparked his interest in competing and later to coach. “I realized that I wanted to teach debate so that both sides of an argument can be appreciated without demonizing the other side,” Key said. To express his desire to reform the team, Key met with communication studies chair J.D. Ragsdale and College of Humanities and Social Sciences dean John de Castro. After receiving their support, he began his search for teammates. “I recruited the initial members over Facebook, doing a search for current Sam students who had the word ‘debate’ in their profile,” said Key. “I cried my eyes out when Adam sent me the first message on Facebook because I needed my greatest passion with me again,” said team member Adesuwa Omoruyi, who had debated through junior high and high school. After sending out messages to prospective members, Key reserved a room in the Dan Rather Communications Building for the first meeting and six people showed up. “Every one of those individuals have earned trophies and awards, including four of them who’ve been the champion of at least one tournament,” Key said. In a meet, students are assigned to be on either the affirmative side, supporting the resolution, or the negative side, opposing it. They are all handed a sheet of five resolutions, which are chosen at random. The teams have half an hour to prepare a case for the resolution. To plan their presentation, the teams rely on their coach, teammates, the Internet, and other resources and when the half hour is up, they present their case in the most persuasive way possible. There are four different competition categories to compete in: the novice division, for those that have never competed in debate before; the varsity division, open to all undergraduate competitors; the open division, for all graduate students, as well as undergraduates that move up; and the team division, open to any two member team. There is an incredible amount of practice put in by the team before each meet, according to Key, who sets up practice times each week at his apartment. “Groups of two or three come over every weekday to go over strengths and weaknesses they have presenting. We also work on refining specific debate styles,” said Key. “We have such a large group now that I need these smaller meetings to make sure everyone gets lots of practice each week. At these meetings, as well as our big one on Thursdays, I’ll usually teach them about one or two specific skills, then have two people debate each other. “After they’re done, I critique them on the round, telling them what worked, what didn’t work, and what to work on,” he said. The team was awarded its first victory in the Mississippi College Deep South Debate Tournament, where Key was named the 4th place speaker in the open division, Clayton Goss was champion and 4thplace speaker in the varsity division, and Addison Reed was a quarter finalist in the varsity division. The second consecutive victory was earned at the end of January in Bossier City, La. at the Tri-State Debate Tournament, an International Public Debate Association sanctioned event. The team was awarded not only the championship title, but individual honors were given to champions Clayton Goss and Addison Reed, as well as 3rd place speaker Key, in the team division. Key was also a semifinalist and 4th place speaker in the open division. In the varsity division, individuals that placed were semifinalist Omoruy, quarterfinalist Clayton Goss, octofinalist and 2nd place speaker Addison Reed, and fourth place speaker Jeremy Trepagnier. In the novice division was quarterfinalist Grayson Posey. The third debate tournament of the season, “Turf Wars,” was held Feb. 6-8 at the newly-opened College of Humanities and Social Sciences Building. The team won by a significant margin, but declined to accept its own trophy and awarded it to East Texas Baptist University. Award recipients in the team division were champion, 3rd place speaker and Texas Team Champion Omoruyi, champion and Texas Team Champion Clyde Lawson, semifinalist Addison Reed, and semifinalist and 5th place speaker Clayton Goss. “My emotions were so high after my partner Clyde Lawson and I became Team IPDA Texas State Champions. I never thought I would debate again after high school, much less become the current state champion,” Omoruyi said. In the open debate division, Addison Reed was awarded 4th place speaker, a semifinalist, and the Texas Open Champion. The team members that received awards for the varsity division were Texas Varsity Champion, 1st place speaker and champion Clayton Goss; semifinalist Adesuwa Omoruyi; and quarterfinalist and 2nd place speaker Jeremy Trepagnier. Novice division award recipients were finalist and 4th place speaker Jerusha Rodgers, semifinalist and 2nd place speaker Grayson Posey, and 5th place speaker Alex Scott. 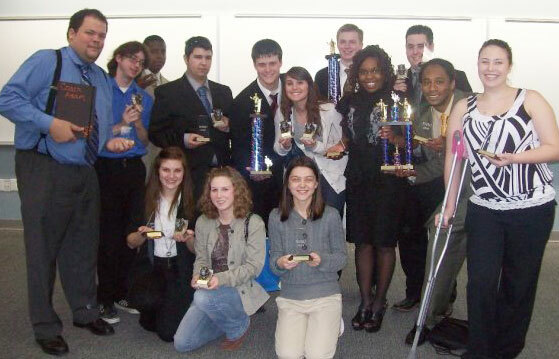 The Sam Houston State University debate team carries on the tradition that Hatton’s team had ended with. They were continually ranked within the top 20 national squads when in 2003 there were well over 200 schools competing. The team had such immense talent, it was not difficult for the dismantled group to move on to other opportunities, according to Hatton. “That semester the members of the debate squad were recruited and transferred to Wake Forest, UT-Dallas, Kansas and Baylor Universities, where they finished their college careers,” said Hatton. For more information about the Sam Houston State University Debate Team, contact Key at 832.515.0167.